Displaying the public opinion of political parties. Favorability of the Democratic and Republican parties fluctuate over time. One day either may be doing well, and the next, one may have a setback that influences how a nation perceives it. One way to measure public attitude is to use sentiment analysis to provide the means to analyze the polarity of a given subject. By comparing the positive or negative word associations around either political party, public response can be assessed. In this case, a political party can be measured in how it’s doing overall and in relation to the other party. 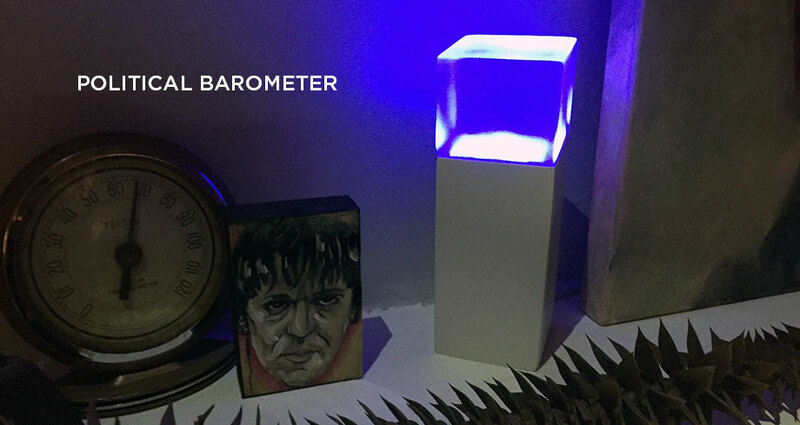 It’s similar to how a barometer measures the pressure over a general area (in contrast to a thermometer measuring the precise temperature for a specific location). Using Twitter as a vast source of online expression, a quantitative rating based on qualitative data may be generated. The higher the number, the better either party is doing. 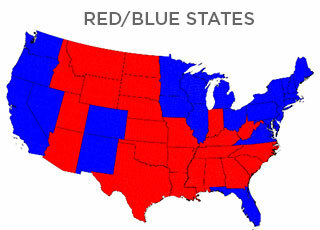 During the 2000 United States presidential election, states were visually identified as either blue or red, indicating which residents voted primarily for either the Republican Party (red) or Democratic Party (blue) candidates. In truth, many states aren’t firmly one hundred percent Republican or Democratic compared with the results of voter counts. This difference in non-binary representation is best illustrated as Purple America: “swing states” that are comprised of both political parties and their respective voters (red + blue = purple). 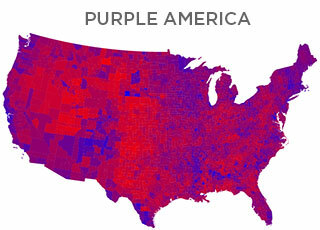 The national map is better represented by shades of purple than well-defined blue or red. Using the results generated from sentiment analysis, we can translate the rating numbers into color values. By assigning each political party a color hue (red or blue) and adjusting the value (based on their ratings), these can be combined to show the overall representation of the nation’s political view. This is done by giving each party their own LED and adjusting the individual brightness. An example, if the Democratic party is doing favorably well, the associated LED will be blue. If they’re doing remarkably well, the LED will be a bright blue. The same for the Republican party’s LED, only in red. These two LED’s sit next to each other and produce various ranges of the color purple; sometimes a faint purple, sometimes very bright. If both political parties are doing poorly, the combined light is dim. If both parties are doing quite well, the light is luminous. At other times the combined color will be more bluish-purple and at other times reddish-purple. 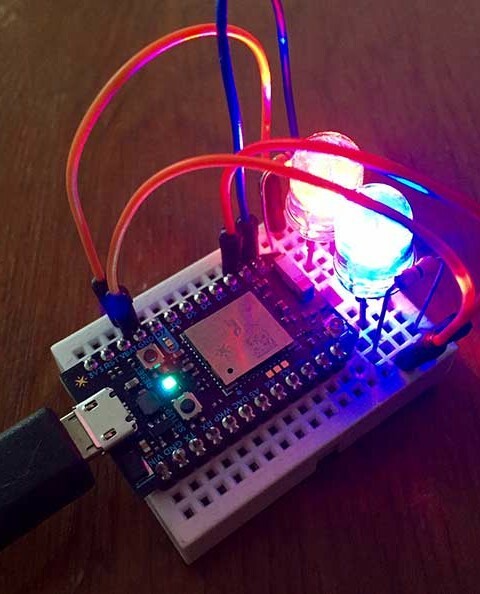 The device is a Particle Photon that polls a server every six hours for a simple character string. The server initiates a call to a third party sentiment analysis service for current data on both the Republican and Democratic party. The results sent back are percentage values for each party. The server translates the percentages into a value from 0-144, which the Photon device can use. These numbers are the intensity of each LED; the higher the number, the brighter the light. 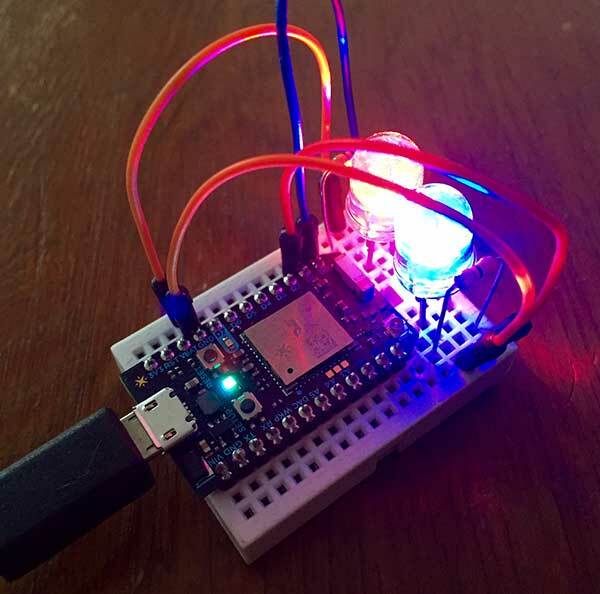 The character string is passed onto the Photon where the numbers are then assigned to the respective LEDs and are instantly lit up. The device waits another six hours before refreshing the data. The principles of an ambient display are to present data in a visually unobtrusive way; a quick glance giving a user affordance. Changes and opinions are slow to present themselves. You won’t find a stark contrast in color deviation, the political representation of the nation is a fairly unified Purple America. And that’s sort of the point.